The story of the origin of the image of the Virgin begins with the search of a young Frenchman named Simon Vela who heard a voice telling him to go to the Peña de Francia where he would find an image of the Virgin. He searched throughout Western France for many years with no success. Finally, he traveled to Spain and one day chanced to overhear a conversation which mentioned the very location he sought. In a dream, he was instructed to look in a particular region where he and several companion witnesses moved a large stone sealing the entrance of a cave. Inside, he found the icon of his quest which was found to have been placed there about 711 A.D. Immediately the medical conditions of he and his companions were cured and recorded as true by the local Spanish authorities. 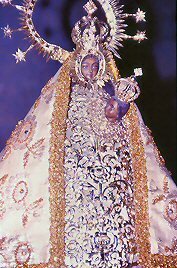 The Philippines received its own image of Peñafrancia in the 17th century as a picture of the original Spanish icon. The picture was in the possession of a young but sickly Spaniard who was studying as a seminarian in the Philippines. But he was constantly ill. 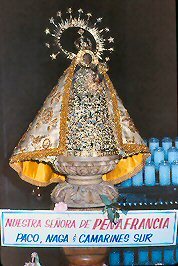 He explained his situation: "There have been so many miracles wrought on me by the Virgin of Peña francia, that I have no tongue to relate them, paper where to write them nor numbers to count them. All I could say is that I am the miracle of her miracles." Once, while traveling to speak with his bishop, the ship the seminarian and his picture was on was caught in a storm which was so severe, it was in danger of sinking and losing crew, passengers, and cargo. But because of their faith and prayers to the Virgin, the storm subsided and everyone arrived safely. A duplicate carved image was made from the original icon in Spain and placed in the church in Nueva Caceres in the Bicol Region. Numerous miracles have been worked through intercessions to the Virgin Mary.